This morning we are providing links to several articles and an op-ed relating to a subject of great interest to residents of Lyme and Old Lyme. Two bills have been proposed in Hartford that promote the regionalization and consolidation of school districts in Connecticut. The first three were published by CTNewsJunkie.com, a fellow member of the Local Independent Online News (LION) publishers national organization, with whom we are pleased occasionally to cross-publish our stories. The second three were published by another member of LION publishers, Good Morning Wilton.com. 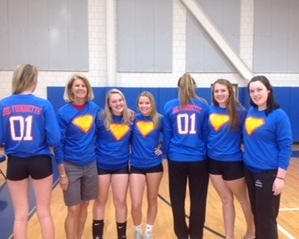 Down in Wilton, Conn., there has already been a great deal happening in response to the proposed Senate Bill 738 formerly 454, including the formation of a grass roots group called Protect Wilton Schools organized by Wilton residents and opposed to the regionalization proposals. Links are provided to each article at the end of the brief introduction taken verbatim from the article itself. HARTFORD, CT — The concept of regionalizing and consolidating school districts to save the cash-strapped state is not a new one, but two new bills pushing the initiative have moved the issue front and center this legislative session. Senate President Martin Looney, D-New Haven, proposed a bill which would force school districts in towns with less than 40,000 residents to consolidate with a neighboring district. 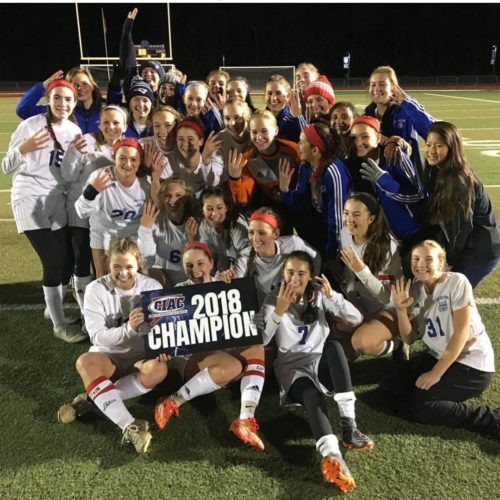 Read the full article by Jack Kramer and published at 5 a.m. on CTJunkie.com Jan. 28, at this link. HARTFORD, CT — A routine meeting of the Education Committee drew a standing-room-only crowd because the agenda included an item on school regionalization. 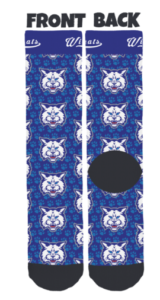 Read the full article by Jack Kramer and published at 1:47 p.m. on CTJunkie.com, Jan. 28, at this link. If there’s one thing I’ve learned from covering local and state government on and off for the last 23 years, it’s that breaking up fiefdoms is a terribly difficult thing to do. And nowhere is that simple truth more evident than in the reaction to a couple of bills floating around the Capitol that propose to force smaller school districts to consolidate with larger ones. Read the full op-ed by Terry Cowgill and published Feb. 4, on CTNewsJunkie.com at this link. Wilton residents up in arms over a state bill proposing regionalizing school districts have formed “Protect Wilton Schools,” to organize efforts to try to stop the bill completely. At a meeting Thursday night attended by more than 200 people, organizers provided information about the legislative process and the plans they’ve started building to coordinate opposition. Read the full article by Heather Borden Herve and published Feb. 1, on GoodMorningWilton.com at this link. Since last week’s grass roots start of Protect Wilton Schools, the group organized by Wilton residents opposed to regionalization of school districts in Connecticut, there have been some new developments. Here’s the latest on what’s new, and some helpful links to information and news about the issue. Read the full article by Heather Borden Herve and published today, Feb. 5, on GoodMorningWilton.com at this link. 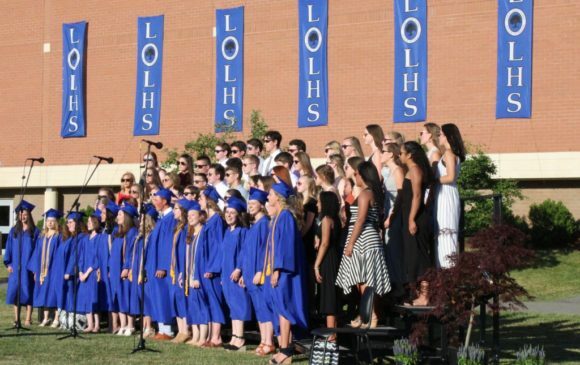 The Ruth Ann Heller Music Foundation Board of Trustees is pleased to announce that it has recently awarded private study music scholarships for 2018-2019 to students from Lyme-Old Lyme High School and Middle School. Award recipients from the High School are: Emma Bass, Kate Chenery, Elizabeth Cravinho, Megan Cravinho, Jackson Goulding, Kylie Hall, Nevin Joshy, Owen Kegley, Ryan McTigue, Connie Pan, Nikolai Stephens-Zumbaum, Lian Thompson, Avery Wyman, and Connor Wyman. Award recipients from the Middle School are: Bridget Allan, Callie Bass, Livie Bass, Micah Bass, Natalie Buckley, Shane Eastman-Grossel, Ava Gilbert, Alexis Grasdock, Nyla Goulis, Karissa Huang, Aggie Hunt, Beatrice Hunt, Phoebe Lampos, Van Lampos, Brendan Landry, Audrey LeCour, Evan LeQuire, Andrew Liu, Marielle Mather, Eli Ryan, Morgan Standish, and Luisa Warlitz. As a supporting organization for Region #18 schools, the Ruth Ann Heller Music Foundation awards scholarships to be used for private instruction to instrumental students participating in Lyme-Old Middle and High Schools band programs. 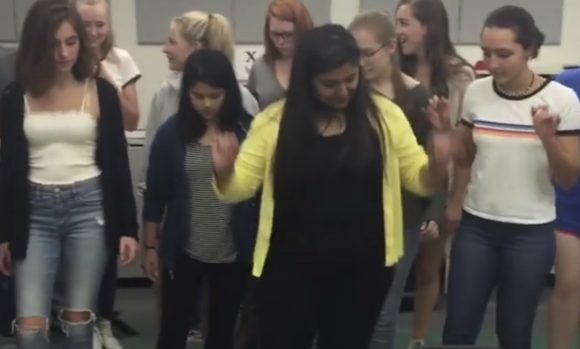 The 501(c)(3) non-profit foundation formed in 1999 after the retirement of Ruth Ann (King) Heller from Lyme-Old Lyme High School, with a mission to consistently strengthen and improve the instrumental music program in our schools. 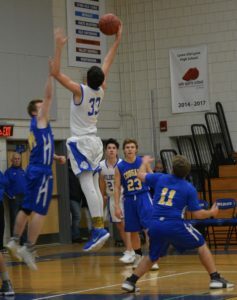 Aedan Using leaps to make a shot in this file photo from the Old Lyme game against the Haddam-Killingworth Cougars. Aedan Using led the team with an extraordinary 21 points, 14 rebounds, five assists and four steals. Connor Hogan added 10 points. The win advances the Wildcats to 6-1 overall and 6-0 in the Shoreline Conference. 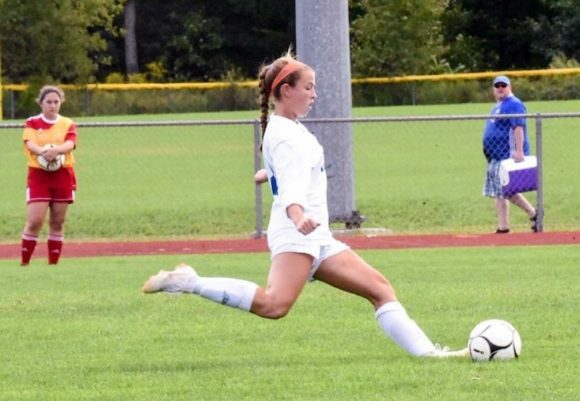 Mya Johnson, a senior at Lyme-Old Lyme High School, was named yesterday by The Day as their ‘All-Area Soccer Player of the Year.’ We send hearty congratulations to Mya on this well-deserved honor. Read the full story published yesterday on TheDay.com and written by by Vicki Fulkerson at this link. Taking place this year in Reno, Nev., the Junior Olympics attracts the fastest young people from all 50 states. 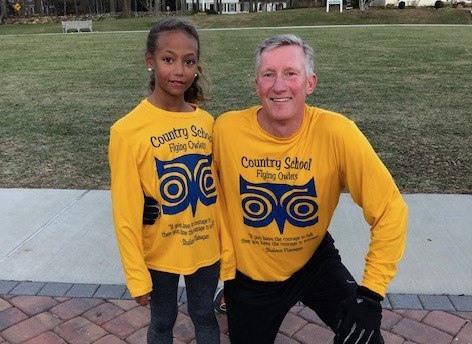 Old Lyme resident Laila Goodman, who is in second grade at The Country School in Madison, took 8th overall out of the 168 female runners who qualified for the 8 & Under race. Goodman is pictured below with head of School John Fixx. After the opening 400 meter uphill, Goodman was in 26th place and then steadily ran down her competition over the 2000-meter race course, sprinting hard at the end to defend her hard-fought position as a young 7 year old. All-American status is achieved by finishing in the top 25 in the United States, and Goodman becomes the second Country School runner to gain that accolade, following in the footsteps of alumnus Robbie Cozean, who was a three-time All-American. Goodman competed with three other Country School runners: Keve Frusztajer of Guilford, and brothers Connor and Sam Duffy of Madison. With these four student-athletes qualifying for Nationals, Country School has now sent more runners over the last six years to the Connecticut Junior Olympics (92), the Region 1 Junior Olympics (79) and the National Junior Olympics (19) than any other school in Connecticut. 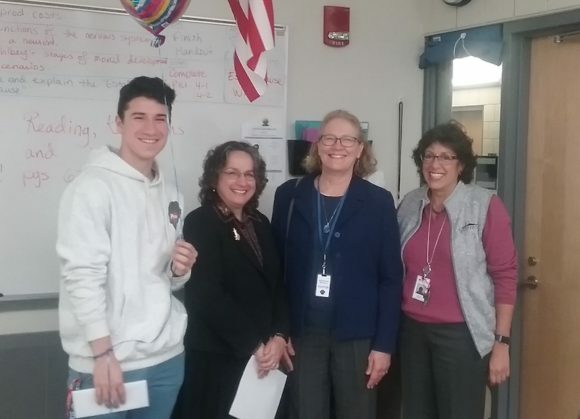 Celebrating Raymond Doll’s selection as the Lyme-Old Lyme Chamber of Commerce December 2018 Business Student of the Month are (from left to right) Doll, Leslie Traver, Lyme-Old Lyme High School Business Department Chair; Jean Wilczynski, Lyme-Old Lyme Chamber of Commerce Board member, and Jeanne Manfredi, Lyme-Old Lyme High School Assistant Principal. Lyme-Old Lyme (LOL) High School junior Raymond Doll has been named the LOL Chamber of Commerce Business Student of the Month for December 2018. The LOL Chamber Business Student of the Month program continues the Chamber tradition of recognizing members of the junior class for demonstrating outstanding initiative in and out of the classroom. 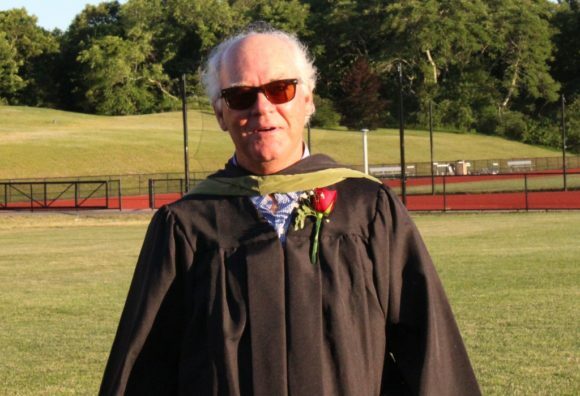 The Chamber established the N. Rutherford Sheffield Memorial Award for Entrepreneurial Promise & Achievement for Lyme-Old Lyme High School juniors in 1999 as a way to honor Mr. Sheffield, a 50+ year member of the Chamber who was highly regarded in our Lyme-Old Lyme community. 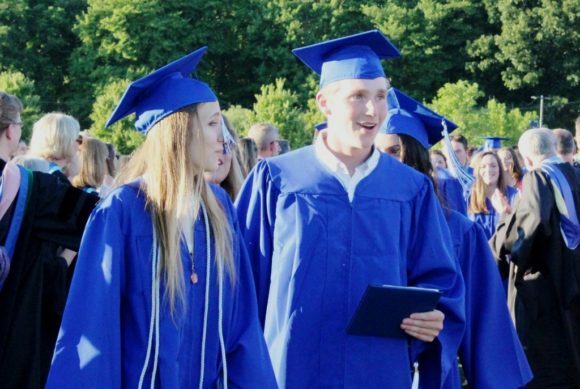 Thirty-five juniors at Lyme-Old Lyme High School were recognized through this program. 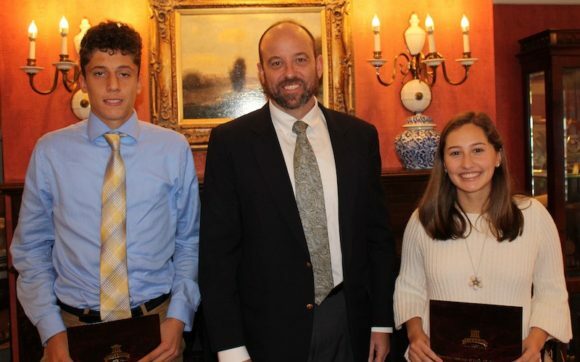 Brynn McGlinchey and Nicholas Fava, students at Lyme-Old Lyme High School, have been awarded the Connecticut Association of Public School Superintendents’ (CAPSS) Superintendent/Student Recognition Award for leadership service to the school, academic prowess relative to ability, and service to others in the community at a ceremony held Nov. 26, at Saybrook Point Inn. Brynn McGlinchey is a bright young woman in every sense of the word. She is an intelligent, high-level student while taking an extremely competitive course load. She is a spirited member of the school community and involved in many activities at school. She gets others to be interested, enthusiastic and involved. 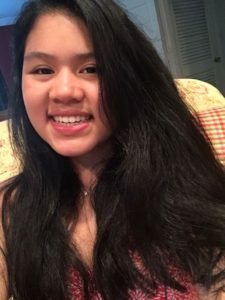 McGlinchey’s style of leadership is calm and deeply thoughtful; she steps to the forefront representing her peers while serving on the Lymes’ Youth Service Bureau Board of Directors and as the student representative of the Board of Education. She is proof that leadership is not about volume but rather the quality of one’s actions and the ability to foster compromise and moving forward effectively. McGlinchey’s vision of the world values our community but reaches much, much wider and it will take her far. 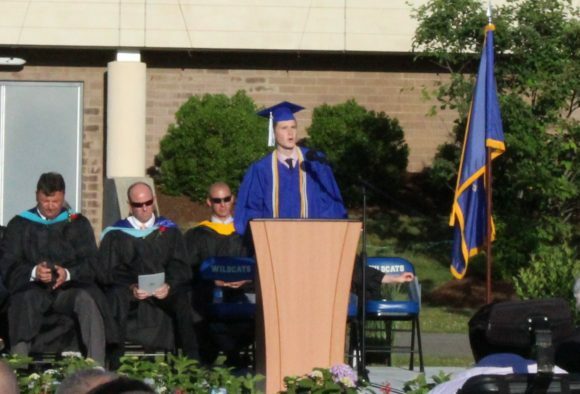 Nicholas Fava has been involved in leadership and service at the high school since his earliest days of his freshman year. He is vice-president of his class and can be counted on to show up and get the job done, whatever the task may be. A three-season athlete, Fava is a key member of Techno-Ticks Robotics Team and the Community Service Club. Fava can seem quiet by nature, but is an excellent listener, assessing the situation and feedback around him to know how the group needs to proceed. 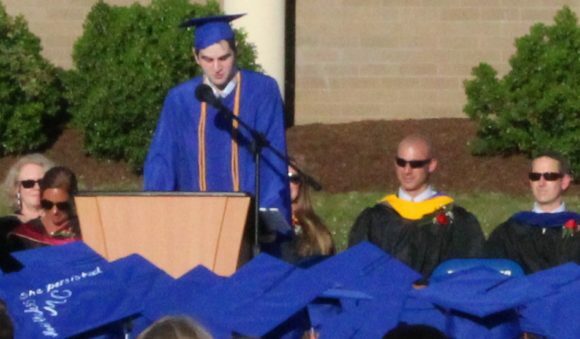 He is academically talented, conquering everything from honors math to college-level Spanish. We have yet to see anything slow Nick down, and we are proud he has come so far so fast. 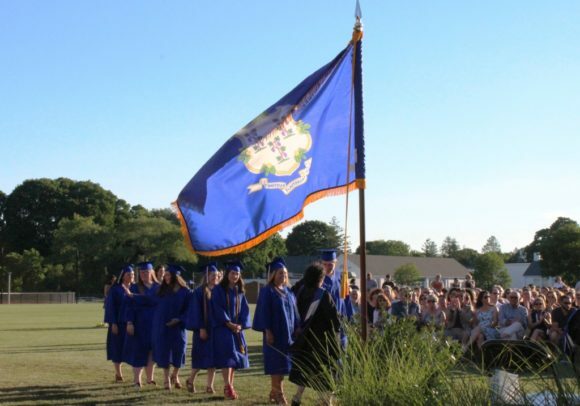 CAPSS, the statewide school superintendents’ professional organization, is based in West Hartford and provides professional development, personal support, statewide conferences, legislative information and educational services to its membership. For more information about CAPSS, contact Ian Neviaser at neviaseri@region18.org or 860-434-7238. The Lyme-Old Lyme High School Safe Grad Committee is hosting a fundraising event at Jonathan Edwards Winery in North Stonington, Conn., this coming Friday, Nov. 16. The event will run from 6:30 to 9:30 p.m.
All ticket sales benefit the graduation night event for the Class of 2019. 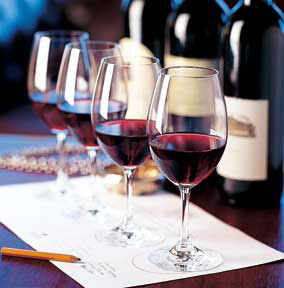 Tickets include a glass of wine of your choice, food and fun. In addition to ticket sales, the winery is donating 25 percent of all wine sales that evening (either for consumption that evening or wine purchased as gifts or for the holidays to take home) back to Safe Grad. Food for the event has been generously donated by Cloud Nine Catering, Coffee’s Country Market, Dock 11 Café, Fromage Fine Foods, The Hideaway Restaurant & Pub and The Public House. 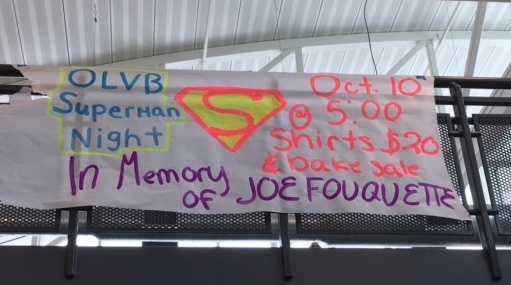 The event is open to anyone who would like to attend and help support a safe graduation for the Class of 2019. The philosophy and ideals behind the Safe Grad Night party are interlinked with providing an evening that is fun, memorable and safe. 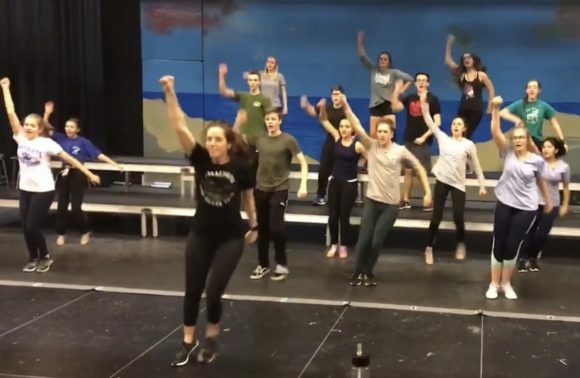 More than “just a party,” the event is a commitment by parents to conduct a great, “once in a lifetime” extravaganza for the graduating seniors. Grad Night is alcohol- and drug-free and allows the senior class to have one final evening together as a class to celebrate their graduation. The event lasts through the whole night and the seniors have no idea where the event will be held until they are on board the buses. History has shown that a significant majority of the senior class attends the event every year. Lyme-Old Lyme (LOL) Schools are considering an expansion of their current Pre-Kindergarten (Pre-K) program to allow all age-eligible students in the towns of Lyme and Old Lyme to attend. 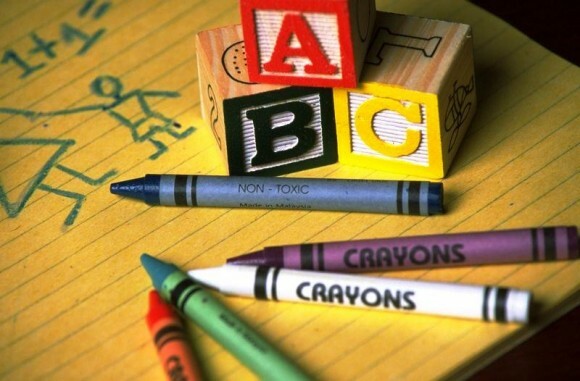 In an effort to prepare all students for Kindergarten, their tentative plan is to expand the current Pre-K offerings to all students in Lyme and Old Lyme and establish a universal Pre-K program based on Connecticut’s Early Learning and Developmental Standards. 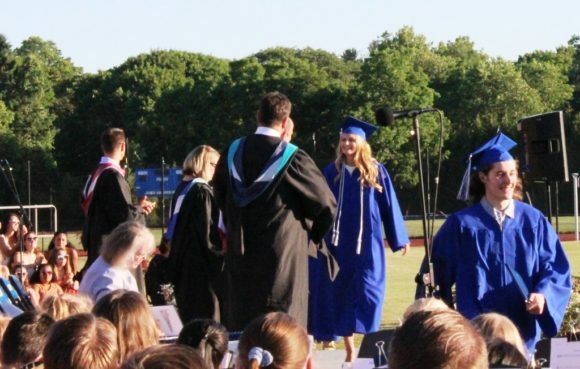 Lyme-Old Lyme Schools also hope to entice non-residents to move to the district, or enroll their students on a tuition basis, to enjoy this added benefit. This tentative plan would begin in the 2019-2020 school year. To assist in the planning process, LOL Schools are seeking reader’s input. If you have a child that will be three- or four-years-old by Sept. 1, 2019, and are interested in your child being considered for this program, you are invited to complete this survey before Nov. 15, 2018. Survey results will be used in both the Pre-K planning process, and to secure spots in this exciting new program. For more information, contact Ian Neviaser, Superintendent of Lyme-Old Lyme Schools, at neviaseri@region18.org or 860-434-7238. 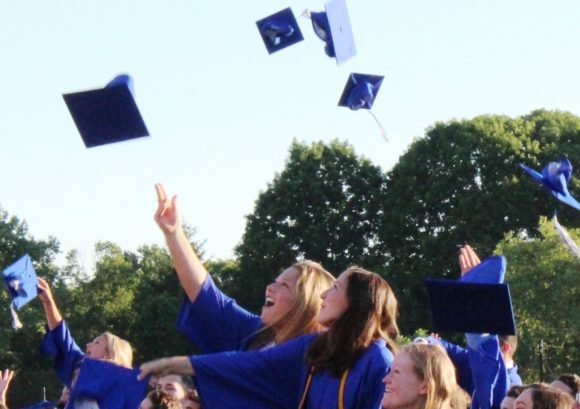 The Class of 2018 toss their hats high into the air to celebrate their graduation from Lyme-Old Lyme High School last night. 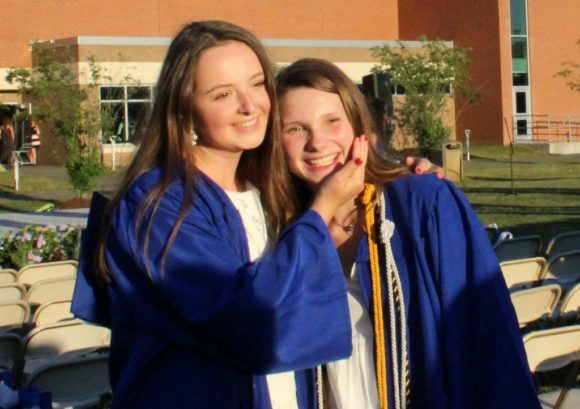 Under clear blue skies and a shining sun, the 110 members of the Lyme-Old Lyme High School Class of 2018 were sent off into the world Tuesday evening with pomp, ceremony, hugs, applause, and plenty of good advice to see them through the rest of their lives. The Lyme-Old Lyme Combined Choirs under the direction of Kristine Pekar sang an upbeat version of “Lean on me,” which drew hearty applause. Spitzer also spoke of the need to seize opportunities, citing his grandfather and Auntie Mame, who used to say, “Life is a buffet, but most people are starving.” Spitzer admonished his class “not to be like most people,” but rather to “stuff yourself silly at the buffet,” as his grandfather and Auntie Mame would recommend. After the speeches, the graduates stood in line to receive their degrees. 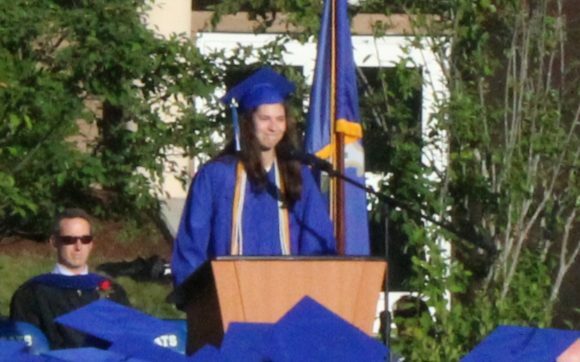 Jordan Lewis smiles broadly as Principal Wygonik prepares to hand her High School Diploma. 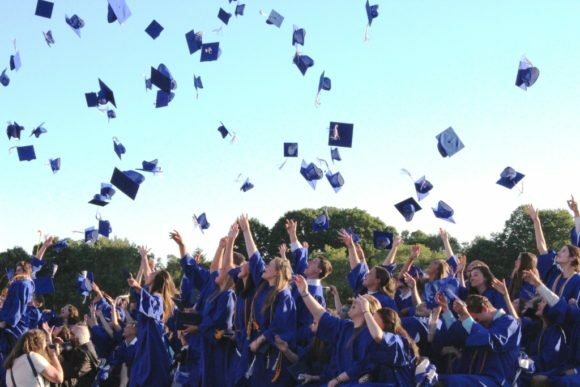 And there they go … caps fly high as the graduates celebrate. Veteran physical education teacher William (Bill) Rayder was named the Mildred Sanford Outstanding Educator Award. 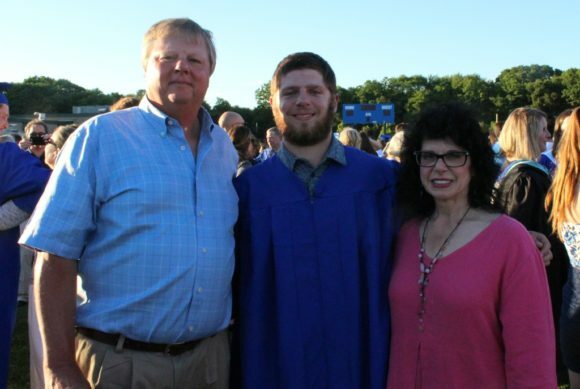 The Fusari family stands together proudly after son Robbie’s graduation. 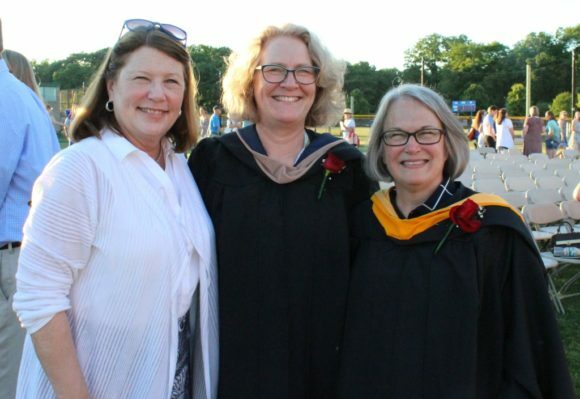 From left to right, Old Lyme Selectwoman Mary Jo Nosal, whose daughter Shannon is a member of the Class of 2018, stands with Region 18 Board of Education Members Jean Wilczynski and Diane Linderman.